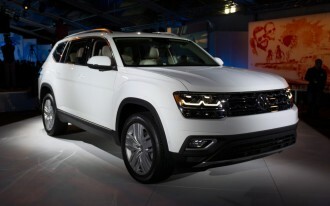 Volkswagen unveiled the CrossBlue Concept at today's Detroit Auto Show, showing a mid-size crossover with three rows of seats that takes direct aim at the successful Toyota Highlander and Honda Pilot. The new concept is a thinly disguised version of a production model that won't launch before the 2015 model year. It will likely be the second product built in VW's new plant in Tennessee, which already makes the Passat mid-size sedan launched last year. 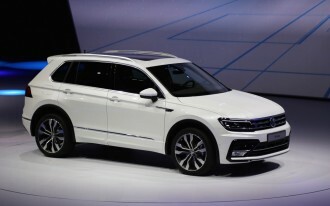 The Volkswagen CrossBlue uses recognizable VW design language--the company calls the crisp lines "clean" and "timeless"--and could almost be a tall wagon version of the similar chiseled Passat sedan. VW is quick to stress that the concept has the "masculine character" of an American sport-utility vehicle, even though it's built on the same modular architecture that underlies the Passat sedan. And this is a VW designed specifically for North America, which buys more large sport-utility vehicles than anywhere else in the world. 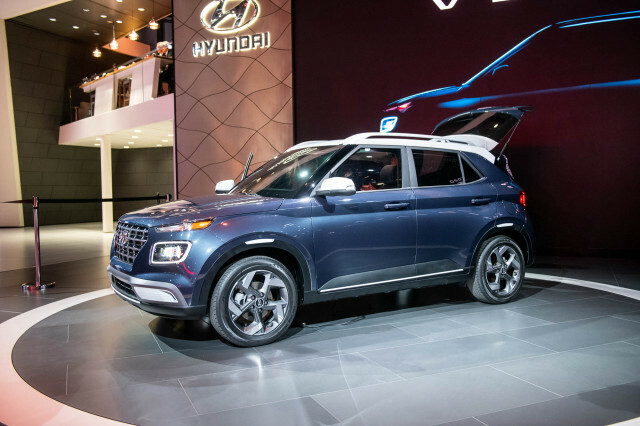 At 16 feet 4 inches long, the CrossBlue is 7 inches longer than the more luxurious Touareg--and it would likely be built to compete on price with the Highlander and Pilot, as well as other contenders, including the Chevrolet Traverse and Ford Flex. 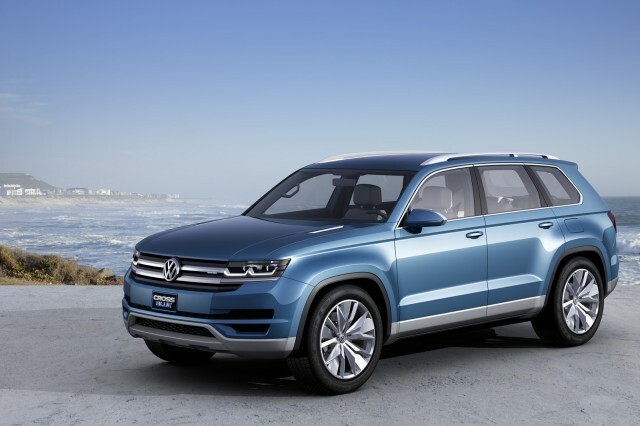 The concept is shown with six seats, but VW telegraphed its intentions by noting that, "if it goes into production," the CrossBlue would flesh out the company's utility-vehicle lineup with a "seven-seat mid-size crossover." Volkswagen claims the mid-size vehicle has the spaciousness and interior flexibility of a minivan--without, obviously, actually being a minivan. The second row seats slide forward using a single lever, and VW has focused especially on headroom throughout the vehicle. The third-row seats are stadium style, giving small children a better view out over the rising beltline. The load bay grows from 49 inches long to 84 inches when the second-row seat is folded down. Even the front passenger seat back folds down fully, increasing the cargo length to 118 inches for half the width of the car--and making trips to the home improvement store much more practical. Inside, a 10-inch touchscreen display is centered on the dash, and every switch except for the hazard flashers is a soft-touch button similar to using an icon on a digital device. Apple iPad Mini devices are integrated into the backs of the front-seat headrests, for individual music or movie choices, and VW features its usual Fender Premium Audio system. Riders in the second and third rows also have their own climate controls. As befits a concept vehicle, the interior is trimmed in leather, wood, and aluminum, with flush knobs that rise from the console when the car is started. Volkswagen's crossover concept is painted in "CrossBlue Glass Flake" paint, and sits on 21-inch aluminum alloy wheels. 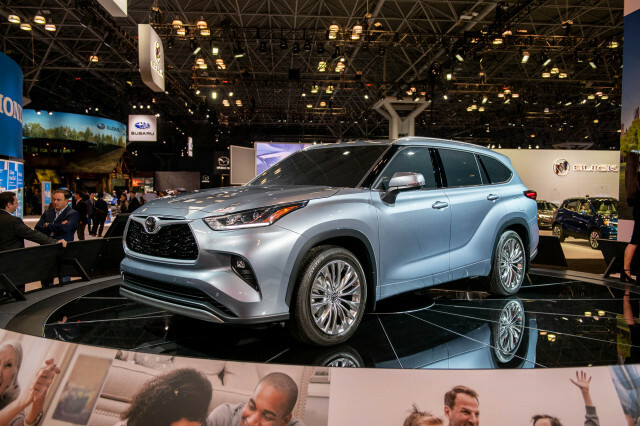 The concept crossover uses a diesel plug-in hybrid powertrain, though the production vehicle is likely to launch with more conventional gasoline and perhaps diesel engines. The diesel-electric powertrain in the CrossBlue is rated at 306 horsepower combined. The engine and electric motors together put out a whopping 516 lb-ft of torque through a dual-clutch direct-shift gearbox (DSG) automatic transmission when all four wheels are powered. The 190-hp 2.0-liter turbodiesel engine is the same one used in other Volkswagen models, including the Passat TDI. It's paired to a 40-kilowatt (54-hp) electric motor that's sandwiched between the engine and DSG transmission. To obtain all-wheel drive, rather than powering the rear wheels mechanically, the CrossBlue uses a 85-kW (114-hp) electric motor to provide torque on demand. 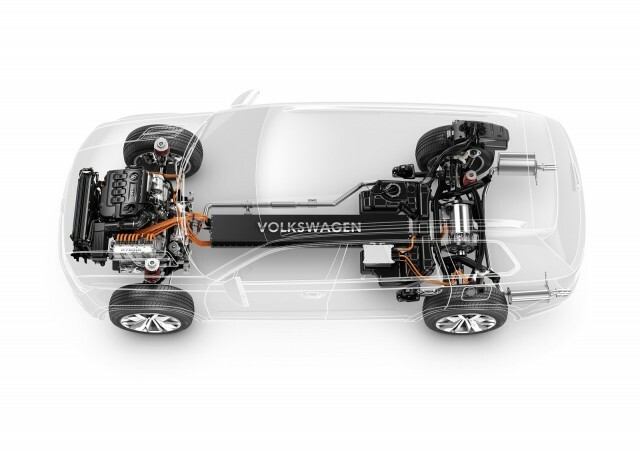 VW calls it "a propshaft-by-wire," and it's similar to the system used in the all-wheel drive version of the Toyota Highlander Hybrid. The CrossBlue's 0-to-60-mph time is quoted at just 7.2 seconds, and VW says the plug-in hybrid powertrain's 9.8-kilowatt-hour lithium-ion battery in the center tunnel gives it up to 14 miles of all-electric range, using only the rear motor for propulsion. Its default driving mode is as a hybrid, but drivers can instruct the car to run only on electric power as needed, which cuts top speed to 75 mph. If the battery pack is depleted, drivers can also tell the car to charge the pack using the engine--where zero-emission driving is desired. There's also an Eco mode, for more efficient travel, and a Sport mode, for livelier performance, which uses the electric motors to boost acceleration. Regenerative braking is used, just as in any hybrid. 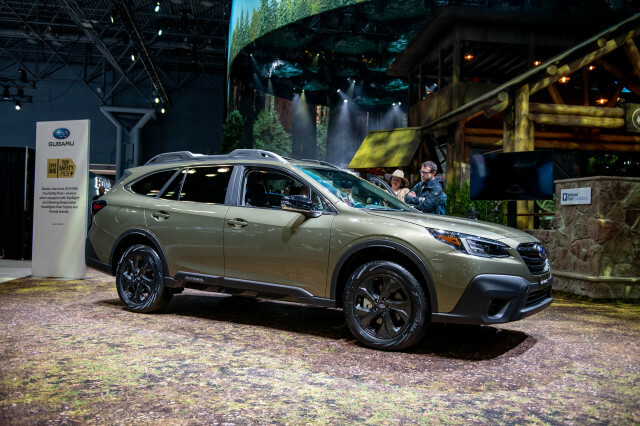 With an 18.5-gallon fuel tank, the CrossBlue has a range of 660 miles--during which time any young family would likely have to stop for the call of nature more often than for refueling. Running in hybrid mode, the company estimates the CrossBlue would be rated at 35 miles per gallon combined (33 mpg city, 37 mpg highway), as well 89 MPGe in electric mode. In addition to the charging port on the driver's side that lets the CrossBlue plug into a charging station to recharge its battery pack, there's also a power takeoff for users to plug in coolers, lights, a stereo, or other electrical equipment--making the car effectively an auxiliary generator. 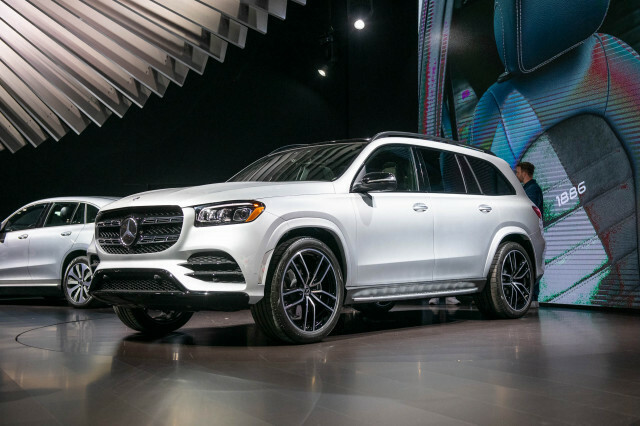 Volkswagen provided airfare, lodging, and meals to enable High Gear Media to bring you this detailed preview from the Detroit Auto Show. Visit our redesigned used cars section today -- over 2 million live classified listings for sale: Used Trucks, Used SUVs, Used Toyotas, Used Fords and more.